Injury to the brachial plexus is most commonly due to birth-related (intrapartum) injury. Brachial plexus injuries are rare with an approximate incidence of 1/1000 births. Intrapartum trauma to the brachial plexus encompasses a wide variety of injuries depending upon which spinal nerves are damaged and how severely each is damaged (ranging from a mild neuropraxia to full root avulsion). As demonstrated by the image above, the C5 to T1 spiral and thoracic nerves send branches that innervate muscles in the shoulder, upper arm, forearm, wrist, and hand. The etiology of Brachial Plexus Injury is multifactorial. However, the basic mechanics underlying the injury include a traction or stretch injury to the shoulder during delivery. 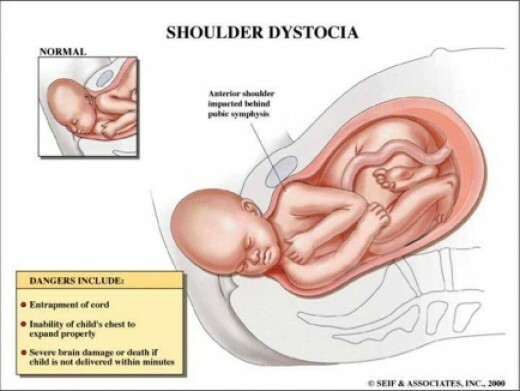 In the classic scenario, the baby’s head is extremely laterally flexed in the attempt to deliver the shoulder during cephalic deliveries that involve shoulder dystocia (Illustration in Slideshow). About 45% of brachial plexus injuries are associated with shoulder dystocia. In the non- dystocia group, one study found an association with primagravidas, small infants, and mothers less than 20 years old. This has led some to believe that intrauterine factors play some role in the etiology. Older children and adolescents can injure the upper portion (C5-C6) of their brachial plexi through contusion or stretching injuries incurred in traumatic falls or from playing football, wrestling, or other “contact” sports in which the head is forcefully flexed laterally. Symptoms of this type of injury are known as “stingers” or “burners” since they cause unilateral burning in the affected arm, as well as weakness, paresthesia, and the inability to flex or abduct the arm. These symptoms often resolve spontaneously within minutes. Bilateral “stingers,” transient quadriplegia, or recurrent stingers are more alarming and justify an MRI of the cervical spine. Brachial Plexus Injuries are usually discovered at birth in the labor suite, signaled by asymmetric upper arm movement, unequal Moro reflex (Illustration in Slideshow), “waiter’s tip” appearance, or shoulder weakness. 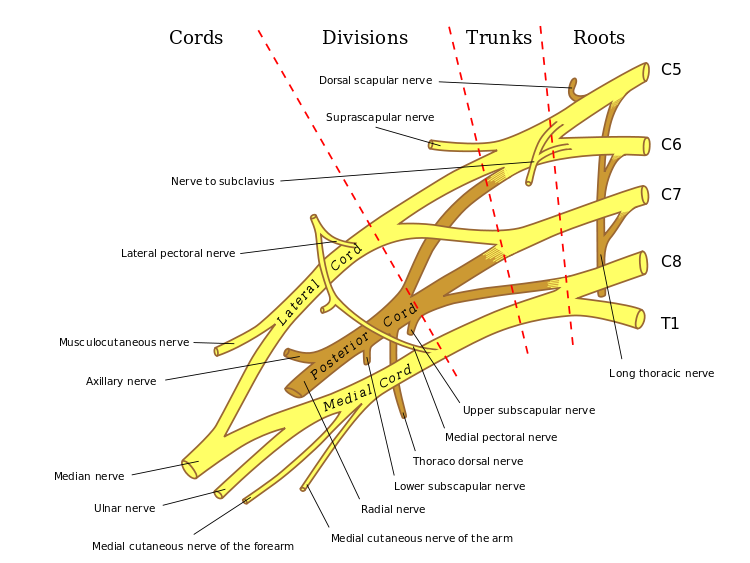 Bilateral Brachial Plexus Injury (10 – 20% of cases) – occurs almost exclusively in breech births. Total Plexus Injury (10% of cases) - injury involves all brachial nerves, C5-T1. Newborn will have a flaccid arm with absent reflexes throughout. 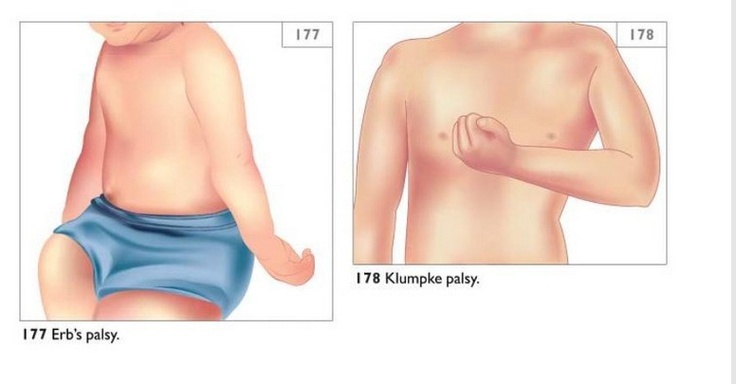 Klumpke's Palsy (1% of cases) - involves C8-T1; newborn will be unable to grasp or flex wrist. If sympathetic fibers of T1 are involved, there may be an ipsilateral ptosis and miosis (Horner's syndrome). This pattern of injury is much less common than Erb's. Prognosis is also poorer than Erb’s. Avulsion – the worst; the nerve is torn out of the spinal cord, often injuring the cord itself. Recovery is poor. Neurotmesis – second worst, but equally poor in prognosis; axonal rupture with disruption of nerve sheath. Axonotmesis –axonal rupture but the nerve sheath remains intact. Outcome is improved. Neuropraxia – the most common form of injury; damage to the nerve sheath alone, causing temporary conduction block; often the nerves will regain complete function spontaneously. Initial management includes careful examination and history taking. Observe the newborn for respiratory distress due to possible diaphragmatic de-innervation. Observe for signs of Horner’s syndrome. Order a neurologic evaluation to recommend further workup and to establish baseline loss of function so that improvement may be monitored. Neurologist may recommend physical therapy to do passive range of motion and prevent contractures and atrophy of muscles. No consensus has been reached about the effectiveness of short-term immobilization. Prolonged immobilization is not recommended. MRI can delineate the extent of damage to the nerve roots. Muscle group transplants and nerve grafting have been done with some success. Reassure the parents based on the below prognostic statistics, but honestly inform them of the seriousness of the injury and the potential for permanent loss of function and/or sensation. Spontaneous recovery occurs in almost 90% of cases. This is because upper injuries, e.g., Erb’s Palsy(C5, C6), have the best prognosis and account for 90% of all brachial plexus injuries. Onset of recovery within 2-4 weeks is a favorable sign. Spontaneous movement of upper extremity by the end of the third month is an excellent prognostic sign. Lower plexus and total plexus injuries (often signified by flaccid paralysis of an entire arm, or diaphragmatic injury, or Horner’s syndrome) have worse prognoses. If there are no signs of improvement by 3-6 months, spontaneous improvement is unlikely, and surgical exploration (contra-lateral nerve transfer) can be considered. Otherwise, the damage will most likely be permanent. Spontaneous recovery is most rapid in the first few postnatal months, but may occur for up to a year. Kliegman: Nelson Textbook of Pediatrics, 19th Edition. 2011.